The setting and the service at SCHLOSS Roxburghe will enable you to connect with your best self and escape the stress of everyday life. Here’s a little overview of what goes into creating our magical guest stays and experiences. SCHLOSS Roxburghe provides you with the opportunity to sample some very special treats. Our kitchen, whose overall concept is managed by Executive Chef Olivier Borja, specialises in regional delicacies and the finest Scottish produce – grown where possible on the Estate. SCHLOSS Roxburghe is an ideal location for your company event or private celebration. The magnificent location, in combination with a selection of rooms for any occasion, state-of-the-art technology, special catering concepts and perfect service create unforgettable events. You can travel to SCHLOSS Roxburghe very easily by car, train or plane, and we also have our own helicopter landing pad. It takes just over 1 hour to drive from Edinburgh and Newcastle airports. SCHLOSS Roxburghe is situated at the heart of the Scottish Borders. Here, in this unique and beautiful location, you can relax and enjoy some wonderful time out from everyday life. Parking is never an issue in and around SCHLOSS Roxburghe. There are plenty of parking spaces available for you in our car parks. Here at SCHLOSS Roxburghe you’ll benefit from numerous services. These include 20% green fee discount for the championship golf course, 24-hour reception service, 24-hour room service, plenty of outdoor parking spaces, recharging point for electric vehicles, concierge service, sports and activities concierge, free Internet and WLAN, luggage service, free daily newspapers and magazines as e-papers. 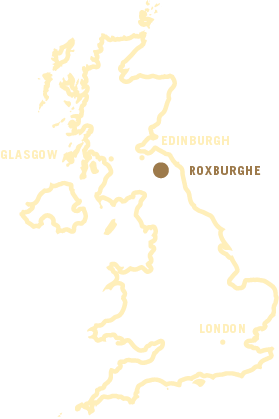 All around SCHLOSS Roxburghe there are numerous attractions to make your visit worthwhile. The spectrum ranges from the magnificent grounds of the Estate including ponds, rivers and a championship golf course to local historical landmarks & the romantic towns of the Scottish Borders. There are 20 suites and rooms in total at SCHLOSS Roxburghe, which provide state-of-the-art comfort and elegance across various room categories. Each room is designed to provide a haven of peace and relaxation.